Once you start looking for patterns, you will see them everywhere. There are patterns in colors, shapes, sounds, dances and even daily routines! Recognizing patterns is a skill that translates directly into algebraic thinking, so exploring these ideas now will set the stage for bigger math ideas later. Your child is ready for more challenging patterns at this age. Six-year-olds can often begin to represent patterns abstractly, and they can figure out what comes next or what’s missing in a pattern. First, create a sound pattern with your child, such as clap, clap, stomp, clap, clap, stomp, etc. First, create a sound pattern with your child, such as clap, clap, stomp, clap, clap, stomp, etc. Then show your child how you can write that pattern down using colors to represent it, such as red circle, red circle, blue circle; red circle, red circle, blue circle, etc. Once your child understands this, have her write her own sound patterns for you to try! Curious George combines art and music in this game. Your child can change the color and size of the paint splatters to create music notes and form a painted song. Some kids learn better using their hands. Some kids learn better using their hands. Why not create a placemat with your child using the "over" and "under" pattern? Simply cut slits that are one inch apart on one piece of construction paper. Then use a different color to create one-inch strips. Weave each strip over and under the strips on the other paper to make a checkerboard pattern. Patterns can be beautiful and functional, too! Your child can play Virtual Goose just like Arthur and his friends. In this fast-paced game, your child can practice matching colored shapes and patterns to their rotated matches. Hand-clapping games (like "Miss Mary Mack," etc.) are often played on playgrounds by kids around this age. Hand-clapping games (like "Miss Mary Mack," etc.) are often played on playgrounds by kids around this age. It may look like she is just having fun with her friends, but your child is actually using repeating and growing patterns! Prunella loves to dance. Your child can dance with her by printing dance cards and then using the cards to choreograph new dance combinations. Using blocks, create a two-block tower. Using blocks, create a two-block tower. Then, next to that tower, create a three-block tower. Have your child help you continue to make a "staircase" of blocks by increasing the towers by one. Now you are creating a growing pattern! See if you can challenge your child to create staircases that grow by two — or start with a tall tower and build the staircase down instead of up. Playing with patterns can be fun. Try these four activities with your child to practice patterning skills. Through engaging stories and comedy, Peg + Cat encourages your child to see math as exciting, accessible, and fun. The show teaches measurement, shapes and patterns, and problem-solving skills that children can use in their everyday lives. Odd Squad agents frequently use their knowledge of shapes to solve odd mysteries. In this activity, your child can sharpen shape skills by completing four shape challenges. The Mathroom is one of the most important rooms at Odd Squad headquarters. Now your child can make her own Mathroom at home with this fun paper craft. HEY YOU GUYYYYYS! 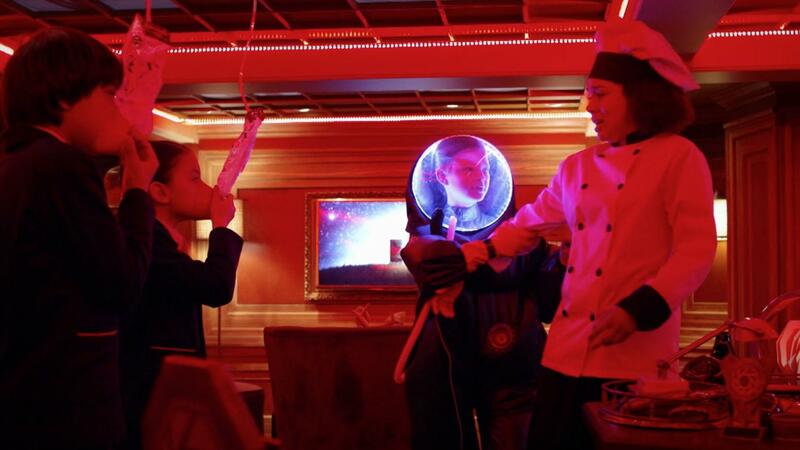 Marcus and Jessica are stuck on Prankster Planet and need your help to get back to Earth! Play this fast-paced board game filled with physical challenges, silly brainstorms, and math questions. Creature Math helps children learn valuable ecology and science concepts while practicing addition and subtraction as they create their very own animal habitat, filled with cool creature pals! In this game, your child will transfer water from one container to another to learn about volume, addition, and subtraction. Your child and her friends can play together in this party game. Children can advance through the board game by working together to solve math, reading, and logic problems. 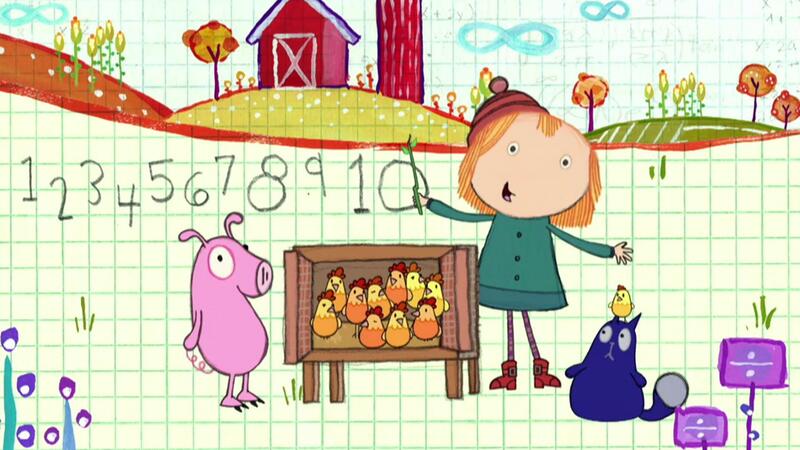 Peg and Cat have 100 chickens to collect, and they count 10 chickens that they have all picked.